McGee Company has a variety of filters for customers to choose from to fit your every compressor. Filters are an essential part of your piping system to prevent against water condensation, harmful dirt and it helps prevent your air compressor from rusting. It’s important to have the correct filters in place to maximize performance and helps protect against premature failure of equipment and tools. Particulate filters are usually installed upstream of regulators to prevent valve failure. 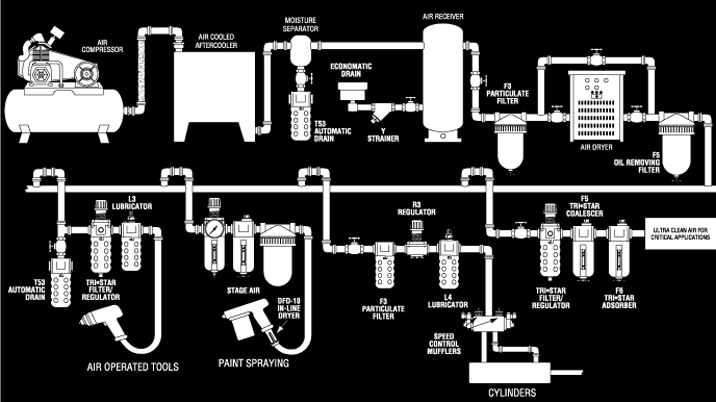 Many pneumatic systems must have air that is free of contaminates like oil and oil vapors, n which case you must use a coalescing filter. McGee Company offers a wide array of filters from top companies like Arrow Pneumatic, Hankison, and Wilkerson ranging from Automatic Compressor Drains to Coalescing filters. Be sure to change your filters out regularly and Consult your sales-rep or visit our online store. Filters are equipped with baffling systems to maximize the amount of liquid and dirt particles they remove. Arrow utilizes bronze elements to remove finer particles, but specific needs can be met for a range from 40-5 microns typically. Designing the right system for your needs is where McGee Company comes in. Our compressed air specialists, seen below, can design the perfect setup for your needs.